Make any milestone or special day all the more celebratory with this oversized hamper, brimming with chocolate, nuts, snacks and fresh fruit. Fresh Pears, Crisp Apples, Premium Oranges. Ghirardelli Chocolate Squares, Coconut Praline Pecans. Cinnamon Chocolate Almonds, Gardetto's Snack Mix and more. Measures 18" x 12" x 8". Sensational Fruit & Chocolate Celebration is a hand delivered gift. These gifts are delivered by one of our local design centers located throughout the United States and Canada. Same day delivery is available for most gifts when ordered before the cutoff time. The cutoff time for Sensational Fruit & Chocolate Celebration is 2 PM in the recipient's time zone. 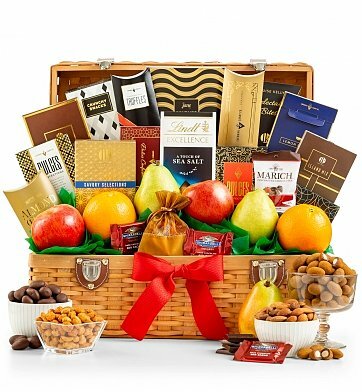 Imagine the elation when they open this generous hamper, filled to the brim with fruit, sweets and savory snacks to share. Featuring fresh fruit, chocolate, snack mixes and nuts. Arrives presentation-ready in our keepsake woven hamper. Sent this to my daughter, it was a nice basket and about 20 items were in there most of them were delicious. I had two gifts to be sent on the same day to different locations. You got it perfect! So nicely put together! Great congratulatory gift! Bought this for my mom for her birthday. She loved it. She said the picture online does not do it any justice. There were more items than noted as well. She loved th reusable basket everything was put in. Would purchase again.